Brief Description: Broadleaf weed with oval shaped weeds, long flowering stems, and small flowers of varying colors spread out over the stem. 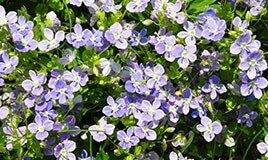 Speedwell refers to many different broadleaf weeds of varying species, all of whom share similar characteristics. Flowers are often bluish white in color, and have four pedals. The plant has a very strong root and a noticeable flowering stem that sprouts from the center of the plant. Speedwell all looks similar, so the different varieties make it hard to identify which broadleaf weed is which. They are also highly invasive – one of the few weeds that can be stronger than turf grass. For any broadleaf weed, prevention starts by ensuring optimum turf health. Aeration and overseeding with proper watering and fertilization is crucial, because speedwell is able to take advantage of any turf weaknesses. However, this may not be enough if speedwell has been introduced to your lawn, because they are one of the few that are able to beat turf grass when their seeds have had a chance to grow. You may need to get broadleaf weed control to have them removed. You can try hand removal, but keep in mind that if they’ve been seeding your lawn may already have a problem. If you’re interested in learning more about speedwell control, and other broadleaf weed control services in the Pennsylvania Tri-State area, contact Green Lawn Fertilizing today.